Flyboarding, a watersport that originated in France and invented by French watercraft rider Franky Zapata in 2011, is now available in Lapu-Lapu City. It is a type of water jet pack with a 20-foot tube attached to a jetski which supplies water to drive the watercraft up into the air. In the Philippines, the flyboard's operation first started in Subic, Zambales in 2012. Lapu-Lapu tourism chief Hembler Mendoza said the new attraction is a welcome development as the city embarks on building more tourism programs. 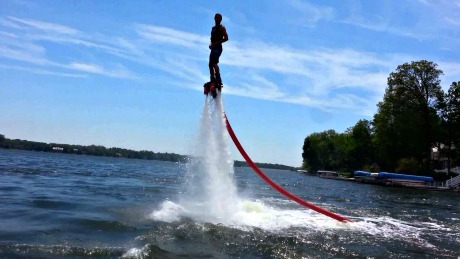 "Flyboard is another alternative sea sport in a recreational kind of way," he said. BJ Ang, owner of the Diamond Watersports in Hadsan Beach Resort, Barangay Agus, Lapu-Lapu city, which operates the flyboard, said this kind of watercraft is a unique activity that local and foreign tourists visiting Mactan island should try. "The goal of Diamond Sports is to increase the quality of watersport activities and equipment here in Mactan," he said. The Diamonds Watersports acquired the flyboard from the Networx Jetsports, a shop specializing in jet skis. Since it is new to tourists, Ang said they are charging P4,500 for 20 minutes of flyboard experience because of the high operational cost. "But it's definitely worth it," he said. He added that among countries that operate flyboard, the Philippines has the cheapest fees as the average rate in other countries is USD150 for 20 minutes. The Cebu City Tourism Commission (CCTC) is now drawing up plans to fix and improve the city's heritage tourism sites as the city’s primary attraction, an official said. CCTC chairperson Tetta Baad said the development of heritage sites as the city’s primary attraction is a recommendation in the study conducted by the Department of Tourism (DOT) and the United States Agency for International Development (USAID). The DOT-USAID study was led by former Tourism Secretary Narzalina Lim, she said. Baad said this is also in preparation for the Asia-Pacific Economic Cooperation (APEC) forum next year. She said the secondary priority is development of the city’s hilly land natural sites to offer eco-adventure experiences, including river trekking, camping, spelunking, mountain biking, among others. Baad said this move is to enhance its appeal to foreign tourists. She said the shopping and entertainment components of the city are excellent and expanding at a fast pace with leading shopping mall Ayala and SM both adding more facilities. Narzalina Lim, USAID project head and president of Asia Pacific Project Inc., also revealed the dilapidated structures in the heritage sites in Cebu, lack of good toilets and support services in tourist destination stops, weak interpretative information that tells stories in a heritage destination or historical site, absence of site guides at Fort San Pedro and limited choices of merchandizing.